Class start dates for Didsbury and Olds will be mid to late September, specific dates will be emailed soon, or call us at 403-846-0640. For Spruce Grove click on the red lettering. 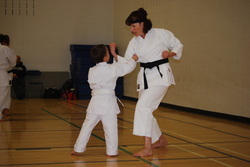 Please sign up for karate club announcements here. Registration begins the first class you attend, however if you are new to our clubs you are welcome to try a couple classes out before committing financially. All prices are listed on the registration sheet before commitment as well. Please see our faqs page and feel free to email us with any other questions you may have. Looking forward to another great year everyone! With locations including Didsbury, Olds, Spruce Grove, & Turner Valley we provide a family-oriented atmosphere with classes for both adults and children. We focus on self defense, self confidence and general well-being.